Are you considering to get a Kamado? Well, you are thinking wise! It is the most ancient method of cooking in the world having almost 3000 years of history. I loved it when I used it for the first time. But choosing a kamado may me a little difficult task as the price may be high for the best quality. In this case, you need to know about your need, features and detail about some best quality grill. To make your selecting process easier I’ve pulled together features, advantages and disadvantages of top 10 kamado grills. So by the end of this guide, you will be able to know which one is best for you. Kamado is the Japanese word used for ‘cooking range’ or ‘stove’ which means ‘place for cauldron’. 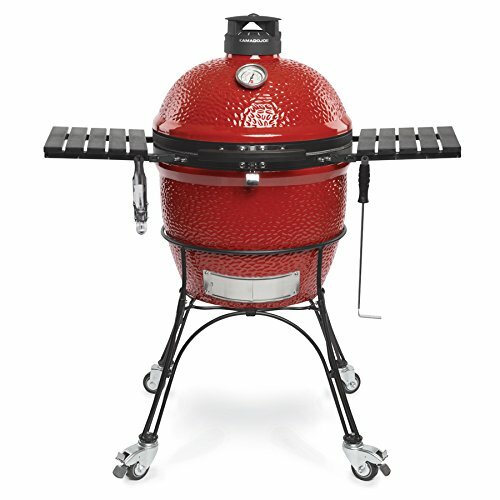 Kamado grills are usually round or oval shaped and made from high-quality ceramic. It can serve you as a grill, smoker or even oven. These type of grills are fueled by wood or natural charcoal and can hold heat and smoke inside them which will add extra flavor to your food. They are best for long and slow cooking like a whole chicken or a large slab of meat. Grilling is so easy in this type of grill, because dampers, built-in thermometer and stand have been added to increase their efficiency. You only need to control the heat after reaching the perfect temperature. According to Archeologists, kamado is the modern version of clay vessels used in ancient China. Then the Japanese begin to use it as ‘mushikamado’ and in the 3rd century. Later on, it also became familiar in Indian Subcontinent as ‘tandoor’. After World War II U.S. Servicemen became enamored with flavor and juiciness of the cooking style and shipped them to home. People also loved the cooking style so many started to import and sell them. In 1974 Big Green Egg redesign the round covered clay vessel to present Kamado. They replace the fragile clay with durable ceramic. The Egg has dominated this industry for years. But now there are many other grill makers are offering their own designed kamado. Another primo Kamado in my list! Why not? They don’t compromise with quality. The good thing of this all-in-one ceramic grill is, it has all the accessories you need for outdoor cooking like grate lifter, ash tool and cart with shelves. With its oval shape you can feed up to 20 people by cooking whole chicken, turkey or ribs which was difficult to put in BGE. Thanks to its higher lid and oval grate. Cooking space can be stretched by placing extra rack. A felt lining on the lid is placed to minimize breakage possibilities. Not need to assemble it before grilling. This grill is shipped assembled, ready to cook. 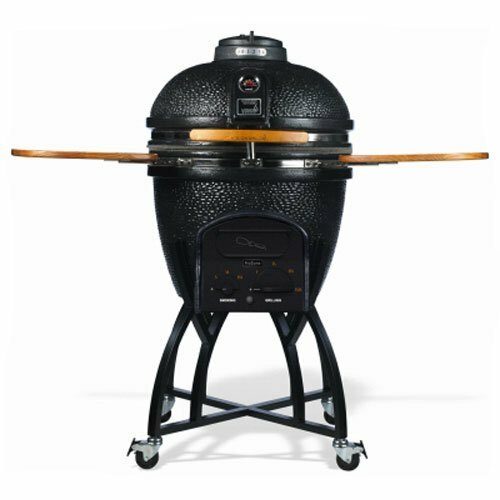 Summit charcoal grill from Weber has multiple functionality to experiment with diverse cooking; Kamado is one of those. Weber is renowned and trusted name in the world of outdoor cooking. This charcoal grill is new in market and over priced, but brace yourself before you know about its features you may want it to make the showstopper of your next BBQ party. The grill is large; made of premium-grade U. S. Steel to make it lightweight. The inner and outer part of the body is coated with porcelain. Ait insulated double walled construction can hold temperature up to 12 hours using small amount of fuel. Main cooking surface is 452 square inches. In addition, hinged cooking surface is also provided to replace many accessories while expanding your cooking possibilities. This grill not only heats up easily, but also lights up instantly due to snap-Jet gas ignition. Like the cooking grates, charcoal grate is also adjustable to create different temperature zones for slow indirect cooking and smoking. There are three vents at the bottom and smoke setting so that you have control over the fuel. One may need a long time and several trials to be used to with all these advanced features. 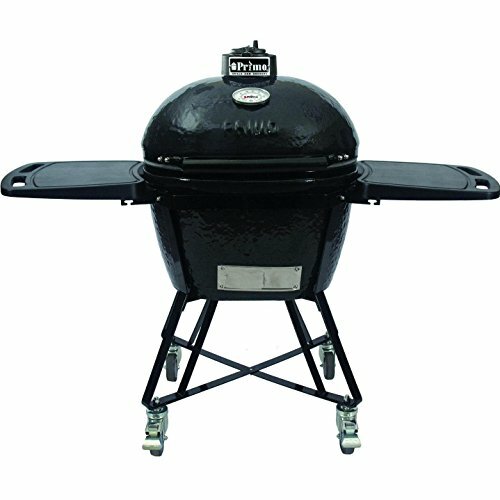 However, the quality, multiple functionality, durability and warranty you get from Summit Charcoal makes it unique. Can create different temperature zone. Primo’s 778 extra large charcoal is one of the most popular ceramic charcoal for its identical oval shape and large capacity. Oval shape enables putting larger sized food like ribs, whole chicken and many more that cannot be done in circular Kamados. It has the largest capacity of 400 square inch cooking space and another 280 square inches can be achieved with rack extensions. The heavy duty ceramic body is coated with porcelain inside and out. Some amazing accessories like firebox divider (on purchase) can do wonders by creating different temperature zones for diversified cooking experience from smoking to grill to roast to baking, together. The only problem is, it is expensive and does not come with a cart and other necessary accessories. However, the warranty you get with it, is expected to protect this ‘state of the art; grill for over generations. Cart is not included with the packaging. 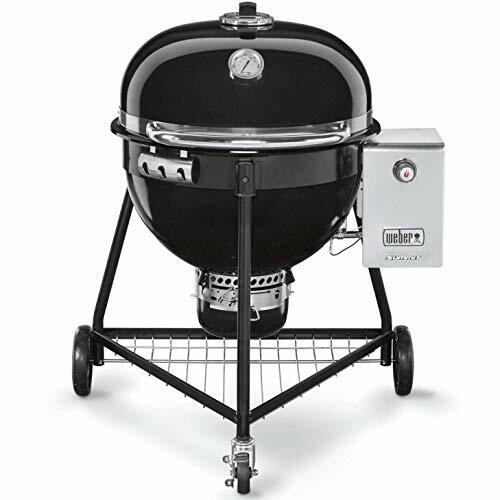 Classic II KJ23RHC charcoal grill is the latest launch of Kamado grill. It has all the goodness Big Green Egg but in much more advanced form. For me, it's flexible cooking surface is the most spectacular feature. It is a combination of several half racks which can be adjusted at different levels which can stretch the cooking surface from 250 to 660 square inches. So that, you can cook your entire meal at once in different temperatures. Second most impressive feature is the lightweight dome, made with air lift hinge technology. Now anyone can lift the lid with only one finger and secure it at any position. The top vent is made rust resistant and efficient in temperature management. The gasket is long lasting and ensures the strongest sealing. 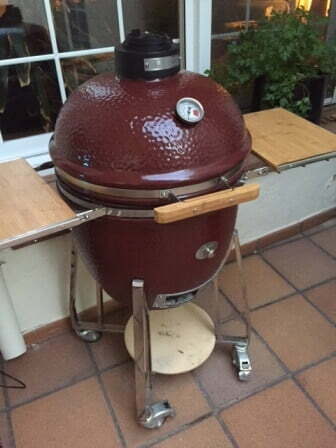 KamadoJoe have brought improvement in the firebox also, it is made with six panels to reduce the risk of breakage. It has Slide out ash drawer at the bottom to make cleaning super easy. The price is slightly lower than other pro quality Kamados but still out of reach of many BBQ lovers. Despite this, You get several accessories and a cart with flipped tables within this price. Have a look on 19 inch ceramic kamado from Hanover if you are looking for a smaller grill within affordable range. 285 square inches (19 in) cooking surface is enough to prepare meal for a family or a small gathering. With the multilevel cooking surface you can cook direct and indirect way to smoke, sear, bake or grill your food. Its ceramic body is thick and insulated to capture the heat efficiently. Its temperature gauge is ranged from 200-700 degrees for cooking, but the grill can produce up to 1100 degrees. This excess heat generating capacity is not for cooking though, its for burning off the mess left inside the grill after the cooking. This self cleaning process leaves only dust to wipe off, making the cleaning of the grill hassle free. Hanover grill comes with a sturdy stainless Steel cart with four wheels at the bottom which can be locked securely. Flipped large shelves are convenient to house much necessities while cooking. One stainless steel grate and another cast iron grate is included with the packaging. This grill can be a considerable option for you if you want quality product without paying for its brand name. Ceramic Kamados of infinite series comes with infinite attractive features. This one has the most sleek finish on the terapex ceramic body. Numerous colors are available of this grill and each can be the center of the attention in your BBQ party. The hardwares are stainless steel made, to make rust resistance. Available cooking surface is 255 square inches but can be extended up-to 432 by adding a rack (on purchase). A part of the grate can be flipped up so that charcoals can be added conveniently. For quick and long lasting heating, the ceramic wall is made 1.25 inch thick. Dials are added at the top to control heat and at the bottom to control smoke. The dome is taller to house large portion of food. It is light too, easy to lift and hold. This product is backed by good warranty. It is pricey and any cart is not included within the price. Despite of the price, this kamado is still worthy to own a functional and decorative kamado for many years. May not be long lasting. Best performance with the least fuel- this is the uniqueness of this kamado. It uses less coal, hence, produces a lot less ash than other kamados. Besides, unlike other kamados, this one can be used all year round, even in the freezing -30 degrees! Now savoring BBQ and smoked food in the chilling weather is possible. The ceramic body is perfect to retain heat within minutes and can hold the heat for hours. No risk of flare ups or hot and cool spots. Its 596 square inches cooking grate is sufficient to feed the crowd. Grate can be flipped to put fuel in between easily. It is done rarely though, this beast can run for 12 to 16 hours with first load of charcoal. Top and bottom vent has knob with them for adjustment. Ashtray is removable too. This super-heavy kamado comes with a four wheeler cart with drop down shelves for easy movement. A cover, electric starter and 2 grills are included as well. It is a little pricey, but its less fuel consumption cuts other costs. Get all the feature of BGE, plus added advantages paying half the price with kamado grill from Pit Boss. 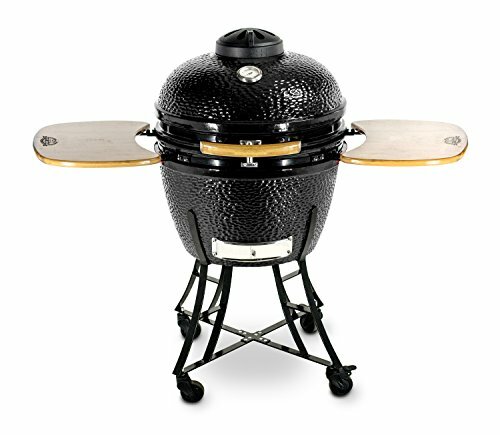 This is the most affordable ceramic kamado with largest 2 tiers 24 inches cooking grates in the current market. Grates can be flipped to put charcoal without removing entirely from the grill. 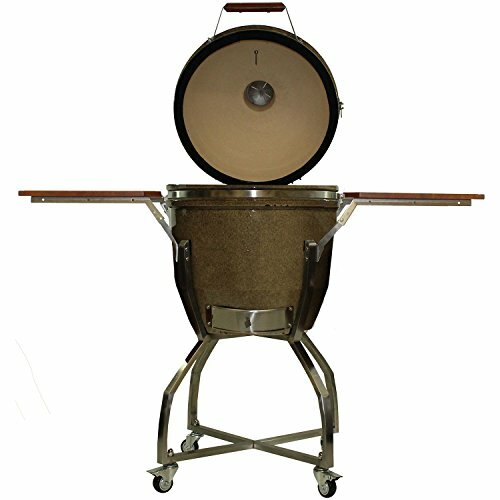 Its lift has many features that cannot be found in the BGE. Like, easy to grip due to wooden handles, easy to lift and hold, fire roof edge ad shock absorbent is included to protect the lid, giving it a long life. Comes with a four wheeler strong cart with bamboo made shelves on sides. Unlike other pricey kamados, the shelves are made durable and long lasting too, just like the main body. Its ceramic body ensures thermal efficiency, whereas the hardwares are made with stainless steel to give them a long rust free life. 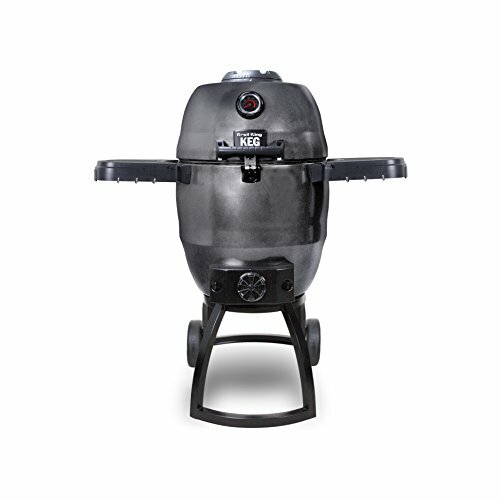 Within affordable range, this kamado from Pit Boss has the best quality and features. Broil King had been thoughtful about the cooking grates of Keg 5000 grill. It is the next level cooking surface for settling in a tight space of kamado. 2 grates are provided, the primary one is cast iron made and can be flipped to add charcoal. The secondary one is rotatable and made with chrome plated stainless steel, no need to remove from the grill, just rotate out of the way whenever you need. Total cooking surface provided is 480 sq. in. summing up the size of the two grates. A sturdy cart is available within the package with trailer hitch adaptability, to make the grill portable. This feature makes this grill suitable for picnic or camping, not only for backyard use. The shelves attached are not high quality though. Ceramic body is coated with steel with an insulation in between, to make carrying this kamado even more convenient, less prone to crack and a satisfactory thermal performance. But lowering the heat once it gets high can be slightly difficult. The fire box is placed too low to sear meat, it is great for slow cooking. Large overhead lid can house large portion of food. Difficult to lower the temperature once it reaches high. Want to master your Kamado skills without breaking the bank? Check out the 16620 Akorn Kamado Kooker from Char-Griller. It is made to let you enjoy all the advanced qualities of high end ceramic Kamados minus the disadvantages in an affordable range. You get 314 square inches cooking and 133 square inches warming rack within the 22 gauge steel body of the grill. Its main body is insulated, constructed to retain more heat using less charcoal compared to ceramic grills. Outer surface has black colored powder finish whilst the inner portion has porcelain coating to to hold the heat for a long time. The only drawback of this worthy Kamado grill from Char-Griller is, it is less durable than ceramic ones, its life span is more likely 2 to 4 years pretty long considering the price. Another problem is, it forms dents instead of cracks if dropped, which can be marked as positive side as long as dents won't affect its performance. I recommend controlling the temperature from 200 to 400 degree will cause less damage to the grill; hence will lengthen its life. Easy to add charcoal and clean ash. The design of a kamado is simple and ancient. It’s egg shape and thick walls help to retain heat & moisture. Inside of a kamado, two third of the bottom is reserved for fuel. Here you can put coals in a small grate. The top part is a domed lid with a built-in thermometer. Here you will find the frill and cooking space which can be seal tightly with the heat retaining lid. The interior of the grill is designed and built in such a way that when the lid is closed, it reflects the heat evenly inside of the grill. If you have decided to purchase a kamado grill, you should check for few things. Because all kamados are not created equally. You should remember your need and look for quality for purchasing a good quality grill. I’ve found out and listed some features of a good kamado grill which may help you if you are on the hunt for one. 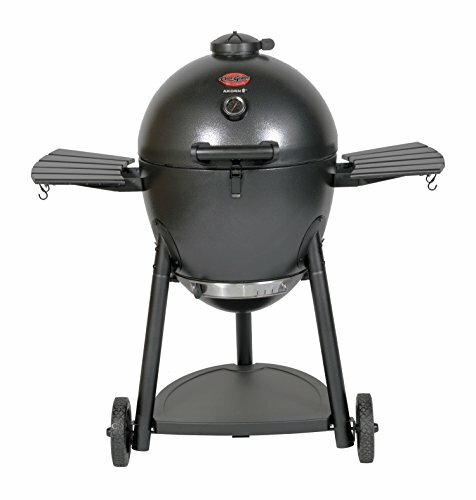 You will find various sizes of kamado grills available in the market. Generally, this type of grill has less cooking surface than other barbecue grills like gas or charcoal. You have to choose them according to your need. If you usually cook grill big stack of ribs or cook for too many people, you should go for a big one. But if you cook food in small pieces for a small family, choose a medium or small one. Kamado grills are generally made of ceramics but there are some enamel coated stainless steel grills available in the market. It’s up to you which one you prefer. If you want a cheaper one, you can buy the steel grill. But downside walls of a steel kamado is too then to hold the heat to cook. Also, it is poor in durability and has a possibility of getting rust. If you want a durable grill, you should pick a ceramic grill. It can hold heat and there is no room for getting rust. It’ll be fun if you can cook various types of food on your grill. Additional accessories with the grill can add this fun part to your cooking. So it would be better if you check the accessories (like- frying pan or pizza stone) the manufacturer offering before buying. These accessories may cost a bit more but will add versatility to your cooking. Must look for warranty and customer support before buying. Some company offers a lifetime warranty, some a little or none. For customer support you must go through their social profiles, there you will find other customer’s experience and their reply. It would be better if your grill has an attached workspace with it. So that you can set your seasonings, sauces and utensils. Ash grates usually come in ceramic or cast iron or powder-coated steel. All of them will work great but you should check if you have any particular choice. You should check the material of the cooking grates and the hinges. These grates are available in enameled steel and 304 stainless steel. Any of them will serve you good. If the grill has hinge under the cooking grate, you will be able to add woods whenever needed without taking out the whole grate. You should also check the vent wheels, whether it has a single or double wheel. Though both will do good, the double wheel will add more accuracy to temperature control. Another point you need to consider before purchasing the grill is - is it easy to set and operate or not. Some grill will take a long time to set- up and operate whereas some take lesser time than others. If you are good to cope up with difficult settings, you can select the first type. If you don’t want to spend more time to set up the grill, pick the simplest one. We have to accept that a high quality, durable kamado grill will cost more. But you should always go with your budget. The price of a grill mostly depends on size and material. So before purchasing, you must consider these things. Many may think why buy kamado grill, not any gas or charcoal grill. For them, I’d like to mention some amazing features which you will get only in kamado grill. 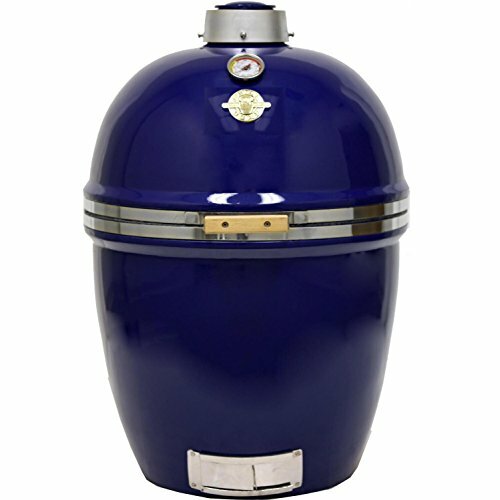 You will get a unique flavor which is fully different from any other grills. emperature control is very easy on this grill. You can cook several types of food like- steaks, kabob, pizza, burger using different cooking methods. They are durable than among all other grill or smoker. Use less fuel than others. Stack lumps of charcoal into a clean, empty firebox. You don’t need to fill up the whole box. Just use as much as you cook your food or you can add more if it takes a long time to cook than you assumed. Open both top and bottom vents. Make a small ‘well’ in the middle of the stack and place the fire starter in it. When the starter is burning well, add some large lumps on top of it and wait till some lumps light up. Now add necessary accessories or racks you need. ​Close the lid but leave the vents open. Check the meter and start closing vents when the temperature reached 100°F below your desired temperature. When you are close to the target temperature, it will be easy for you to control the temperature by adjusting the top vent only. At this step, you can use a digital thermometer to get more accurate reading. If the temperature is still rising even after reaching the target temperature, you need to shut the top vent down a bit more. When the temperature stopped at the target, you don’t need to adjust any vents. This heat will remain stable during the whole cooking time. I hope you will like my unification of best kamado grills and tips about it. If you are going to try this grill for the first time I’d suggest you to pick the steel one. But if you know what you need, go for the most durable ceramic grill. This grill will add so much versatility to your cooking so you won’t be bored. You can taste deliciously juicy food every time with less effort. And the interesting thing is a high-quality grill may serve more than one or two generation of your family. If you are benefited by this discussion to select the one for you, you can let us know. Or if you already have a kamado, you can share your experience with me. I’d love to know about your cooking experience.